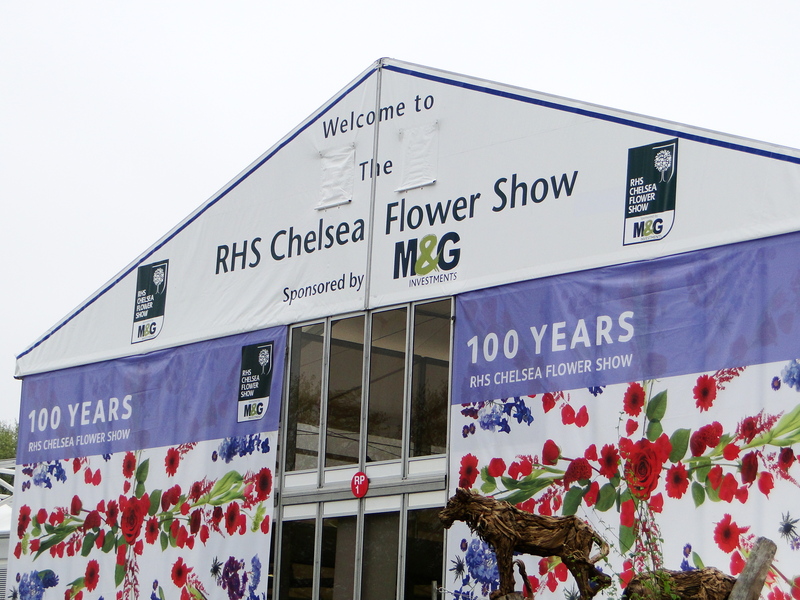 I’ve focussed quite a bit on the design element and the show gardens in my previous Chelsea posts. In this, my final post about my visit I’d thought I’d share the plants that caught my attention and something of the atmosphere on press day. The Great Pavilion is truly enormous. The flower marquees at both Malvern and Hampton Court shows are impressive but this place was like an aircraft hangar. If the focus on design outside isn’t your thing then the nursery stands inside the pavilion could certainly absorb you for a whole day. These are plants and flowers at their peak and prime; nurtured over previous months by their nervous growers in the hope that they will be ready in time. All sorts of techniques are employed to achieve the stunning displays and I’m impressed that with one of the coldest springs on record everything looked so remarkable. I could have done with more time to wander around the pavilion and feel I didn’t give many of the stands enough attention. 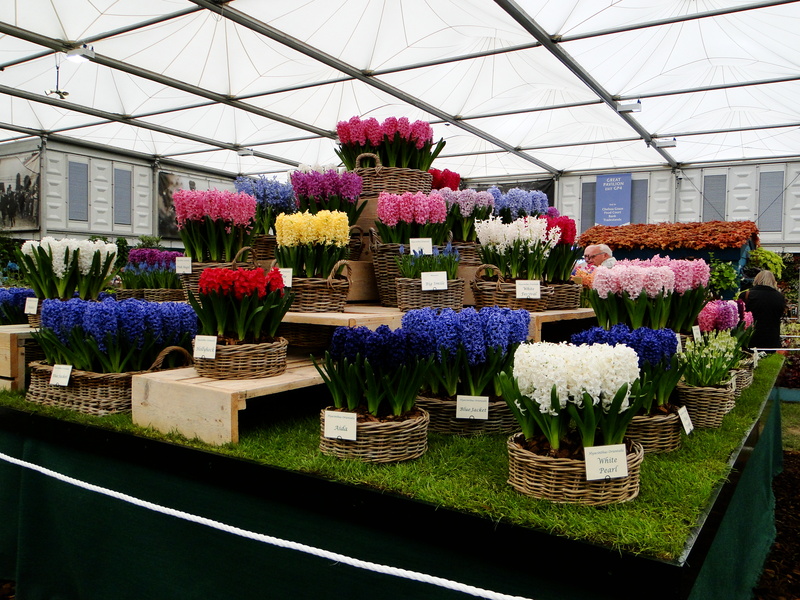 Of those I did see, one of my favourites was the incredible J S Pennings De Bilt hyacinth stand, which I smelt before I even saw it. The perfume really was incredible even on such a cold day. 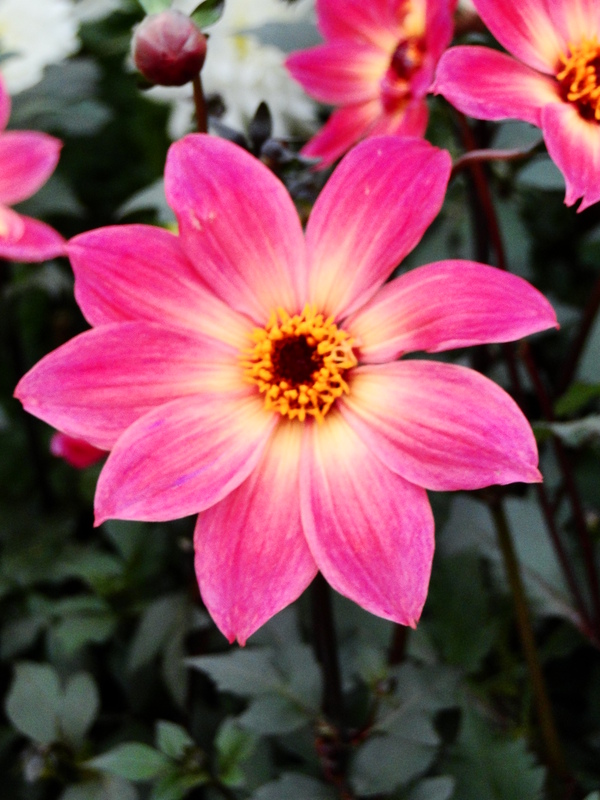 I loved the National Collection of dahlias which showed perfectly the wide range of flowers and forms that are available. I particularly liked the single varieties, especially this ‘Twyning’s Revel’ with its dark stems and foliage and gorgeous pink flowers. The display of alliums on the Warmenhoven stand were dramatic and theatrical and gave me a few ideas for containers of my own next year. The Hillier’s stand was incredible. The colour and sheer energy was impressive particularly on such a dull, overcast day, although there was nothing subtle about it. They transport nearly 3,500 plants to Chelsea to build their stand from birch trees so tall they almost scrape the top of the pavilion to the smallest of perennials. I must mention the artisan garden designed by Ishihara Kazuyuki called ‘An Alcove’ or ‘Tokonoma’. The design recreated an area within a traditional Japanese tatami room, somewhere where meetings would take place with important people. Sometimes the gardens that evoke somewhere come in for stick with the accusation that they are a bit clichéd and not cutting edge. I loved it. I have always wanted to visit Japan but I’m not sure I’ll ever get there, so to see a part of their culture up close was a real treat. 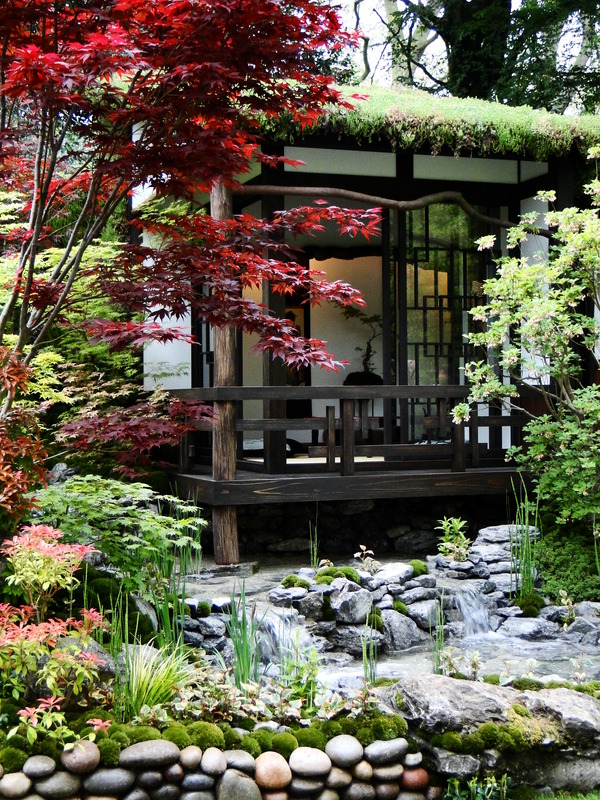 Mr Kazuyuki’s attention to detail is incredible – the cobbles, the moss, the acers, it was a delight and deservedly won ‘best in show’ in the artisan garden category. Where were all the gnomes? 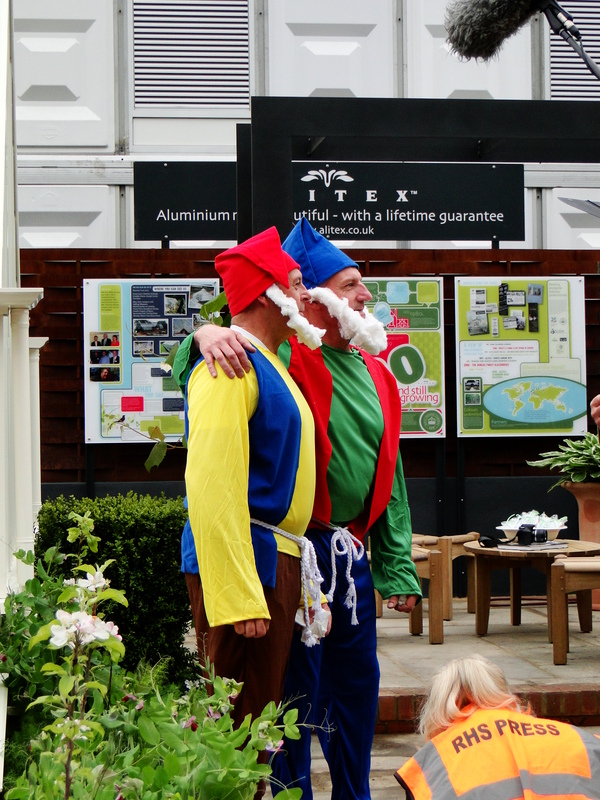 For the 100th anniversary gnomes had been given special dispensation and were allowed access to the site. To be honest, I was a bit disappointed I didn’t see any. The two men wandering around in gnome costumes didn’t count in my opinion. By lunch time the frantic buzz around the show gardens from the press photographers had waned, but as the celebrities who are invited arrived, flash bulbs started to go off once again. Spotting Ringo Starr and his wife, Bond Girl Barbara Bach, I attempted to subtly get a shot for Wellyman of his teenage crush. Barbara Bach of course, not Ringo. Unfortunately I was muscled out of the way by a much more experienced photographer and ended up with a shot of the back of their heads. I did manage to sneak on to Chris Beardshaw’s garden, behind Anneka Rice, when it was opened up for the celebrities to have a wander around. Not because I was particularly interested in her but it did mean I got a much better look at the garden and plants. Another of Wellyman’s crushes he’s rather gutted he wasn’t able to go. Alcohol was flowing by the time I left, whether it was champagne, Pimms or Mark Diacono’s cocktails. If you were a member of the build team for the Trailfinders Australian garden I think it might have been flowing a little earlier. I was stood next to one of them at 9.30am and he already had a pint of something in his hand. They were all dressed in matching outfits which meant they looked like they were all on a stag do. I can only imagine what their celebrations were like the following day when they found out they had won gold and ‘best in show’. I, on the other hand, was a bit like the rabbit in the advert that didn’t get the Duracell batteries. After only two hours sleep the night before my energy levels were running low by about 2pm and I didn’t think it was wise to partake myself. I would have loved another trip around the Great Pavilion, but my legs wouldn’t take me any further and, with a long drive back to Wales, I wandered out of the show ground just as the police arrived to secure the area for the arrival of the Queen. I loved my first visit to Chelsea. 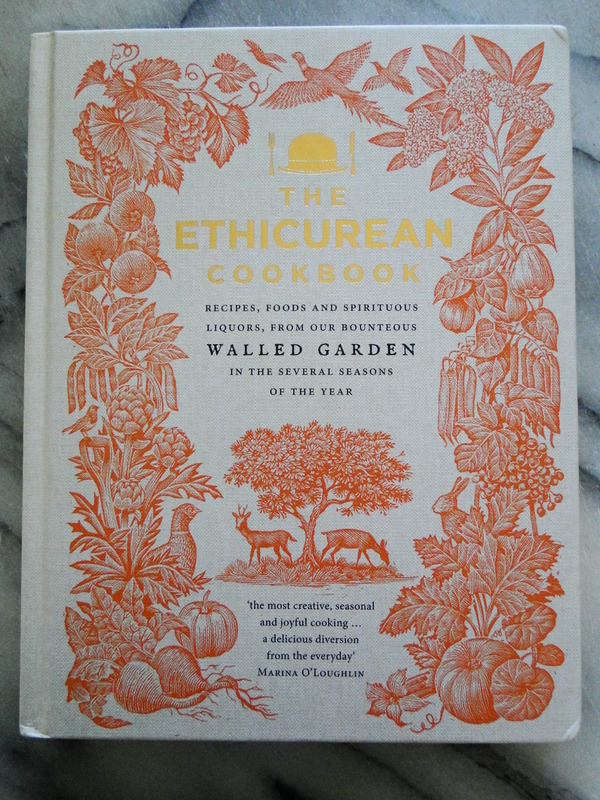 There are elements of it that are elitist and out of touch with how most of us live and garden. I’d like to see more variety in the designs, more edibles and grow your own on display but it’s good to have something that’s glamorous, exciting and inspiring every once in a while. 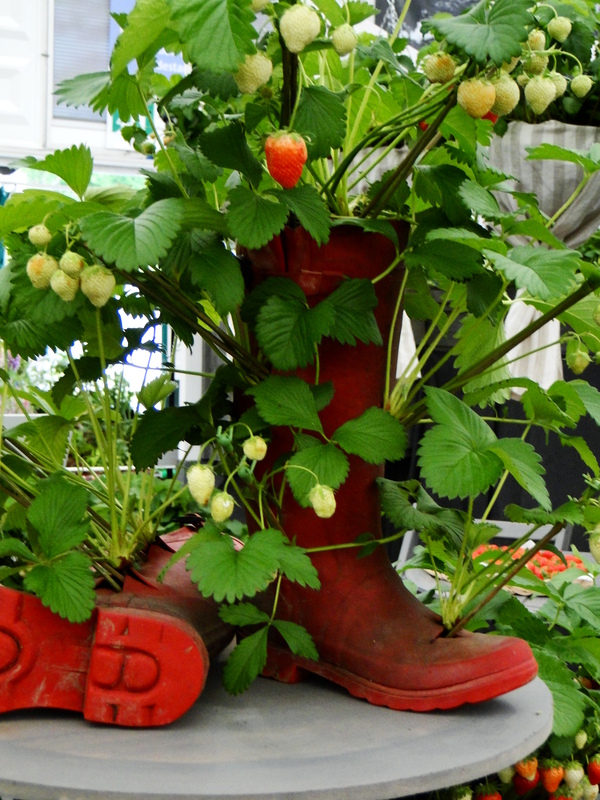 And, ultimately, Chelsea Flower Show is a great showcase for horticulture. 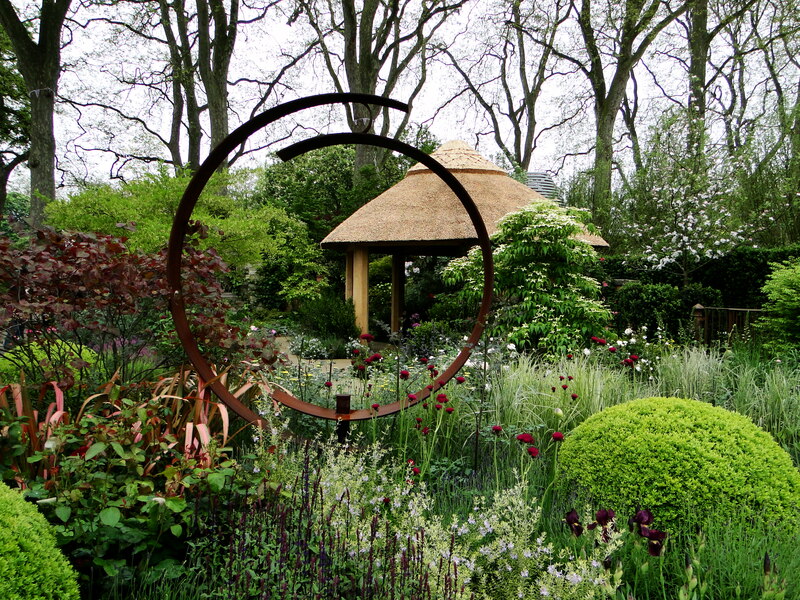 It tends to be the show gardens that attract the most attention at Chelsea. 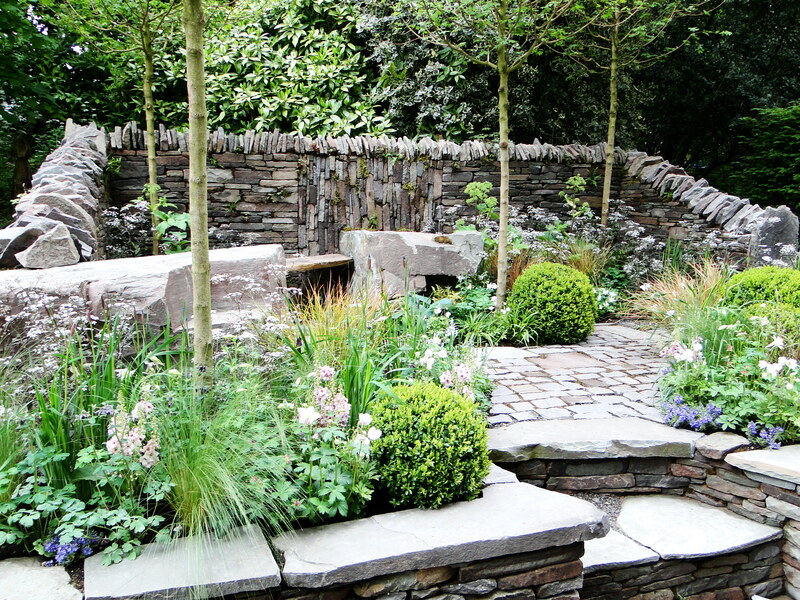 Large sponsorship budgets and top garden designers combine with the intention of creating the wow factor. Show gardens can take a year to 18 months in the planning and 3 weeks to build. Then, on the first Monday of Chelsea the designers step back as the world’s press enter Main Avenue and the criticism and plaudits begin. 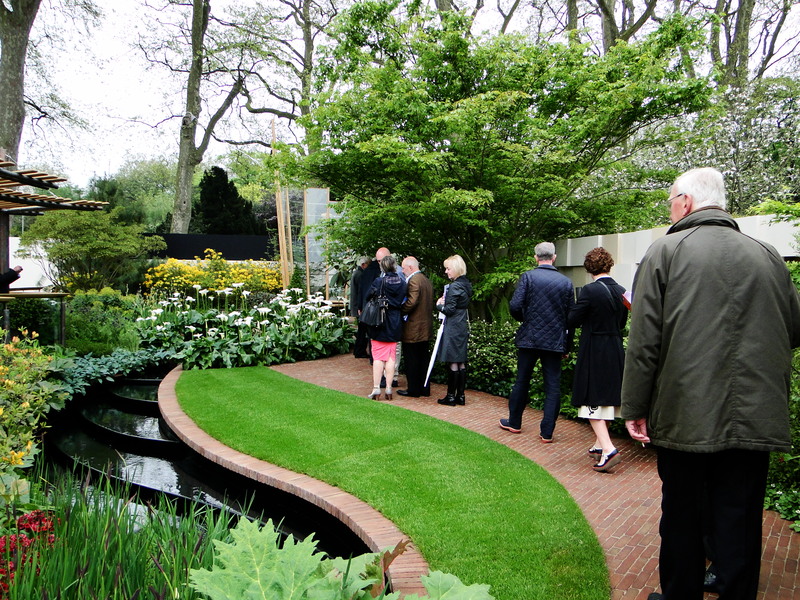 A hush descends on a garden as the RHS judges enter and the designer looks on nervously. 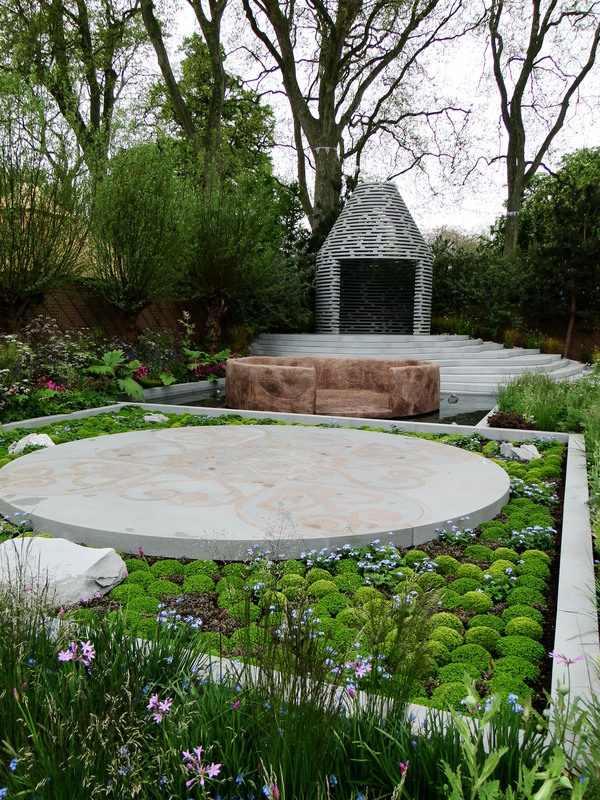 Gardens are awarded medals – gold, silver-gilt, silver and bronze on how well the garden meets the brief that was initially submitted, overall impressions and the quality of plants and the build. There is no quota for each medal so, technically, every garden could win a gold medal. 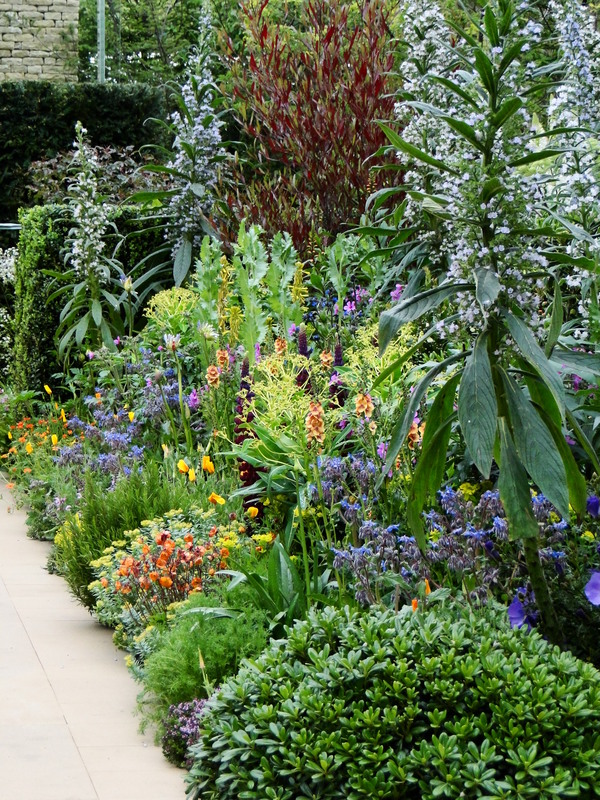 Designs are also judged purely on their own merit and not compared to other gardens in the show. The results of the judging are then announced early on Tuesday morning. Of course, everyone has their own opinion and it was interesting to be there on press day as the judging was taking place and hear the thoughts and predictions as to which gardens people liked the most. If the comments on twitter were anything to go by I wasn’t the only one to be surprised that 10 out of the 15 show gardens won gold. For me it wasn’t that gardens were badly designed or unattractive but some of them just didn’t do it for me. Whilst the judges might assess the gardens individually I would say that most people including myself tend to compare each garden. The show gardens are quite an odd concept. Appreciating a garden fully only really happens when you can immerse yourself in it, wander through it, touch and smell the plants. 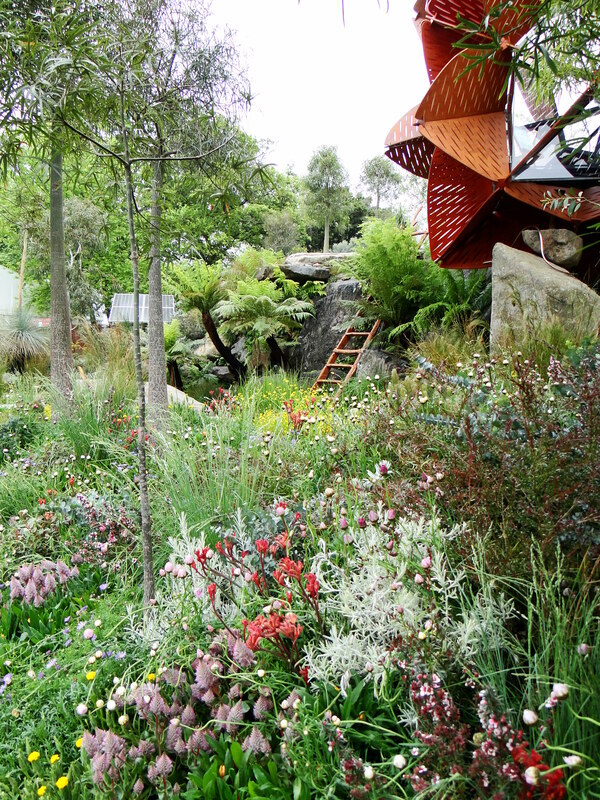 Show gardens however provide a two-dimensional experience. Judges and some members of the media can get access to the show gardens but the rest of us have to view from a distance. Of course it would never be feasible to allow the numbers that visit these flower shows full access to the gardens but it might be one explanation as to why the opinions of the judges and the public so often differ. Then there is creating a garden that will look perfect for the third week in May. 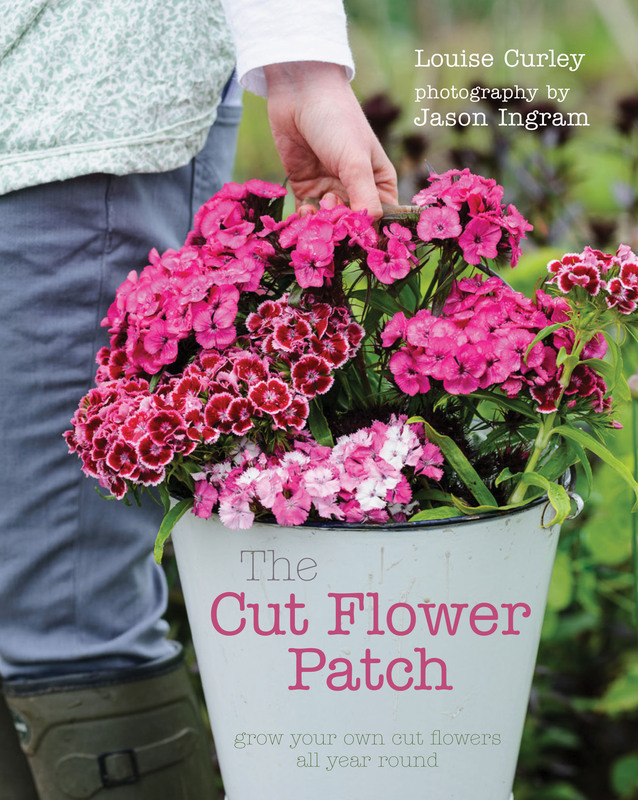 For most of us the challenge is a garden that will look good throughout the year. Plants need to be placed much closer together than you would ever do in reality to create that feeling of abundance and impact. And what about the practicalities of such a designs in the real world. I looked at the beautiful polished golden York stone path on Roger Platts’ garden having muddy footprints wiped off it before some filming was about to take place. It’s honeyed tones were stunning but it did strike me as being the horticultural equivalent of the white-painted lounge and a toddler with a chocolate bar. 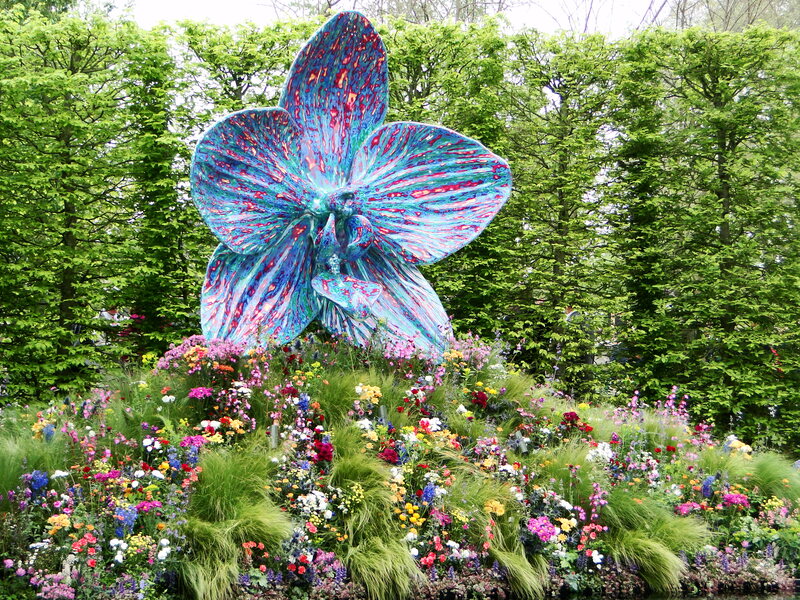 Criticisms of the show gardens often focus on the lack of originality. Occasionally there’ll be a Diarmuid Gavin design which stands out or there was the plasticine garden created by James May. These gardens gain a huge amount of publicity which I get the feeling annoys the ‘serious’ designers. Whether you think such gardens should be allowed into Chelsea or not they do offer something different. I’m not suggesting the gardening equivalent of a theme park but a little more variety would be nice. Perhaps it isn’t so simple though. A show garden comes with constraints and limitations before the actual design process has even started. The size and shape of each garden is restricted by the needs of the show-ground access to the site, and services such as underground cables and pipes. Then there’s the need to allow visitors to see as much of the gardens as possible without creating bottlenecks or possible damage to the gardens. Often there is a story behind a design. Sometimes this can be quite obvious, for instance Nigel Dunnett’s rooftop garden with the idea of showing how with increasing pressure on urban land we should be looking at the potential of our roof space for planting and creating new habitats. 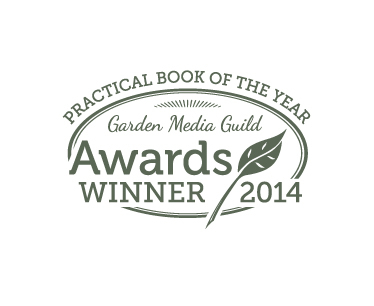 For me Jinny Blom’s garden was harder to ‘understand’. I loved elements of the planting but was left a bit cold by the areas of hard landscaping and the stone structure at the back. It was only later that evening when I saw her explaining a bit about the garden on TV that the design made more sense. Inspired by the landscape of Lesotho she had wanted to capture the rocky terrain and buildings that reminded her of the country. Unfortunately this rather passed me by on the day. It didn’t take long on Monday for me to spot the theme of naturalistic planting which was a feature in so many designs. 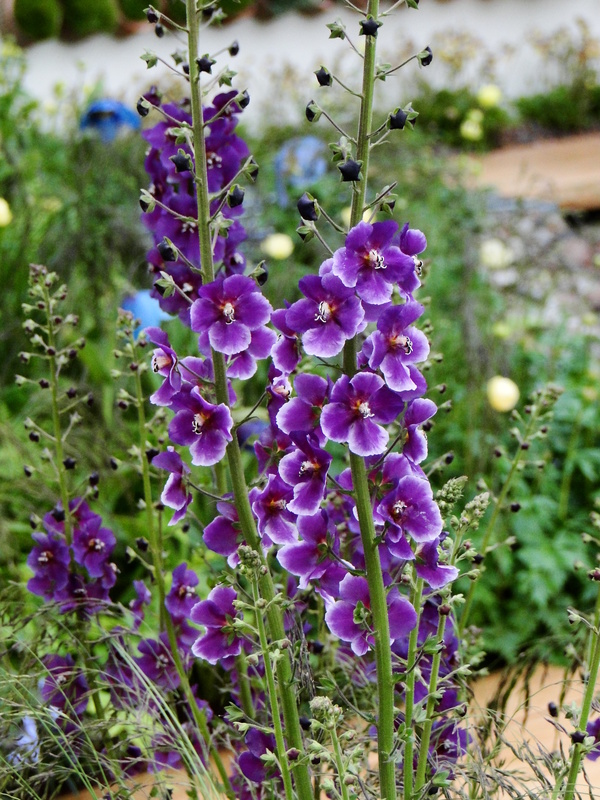 It has been popular at Chelsea for several years now and is the kind of planting that really appeals to me. I love grasses, poppies and umbel flowers and use that kind of planting in my own garden but you can have too much of a good thing. Just as Dianthus carthusianorum was everywhere last year at Hampton Court, it is the turn of cow parsley to be the ubiquitous plant of Chelsea 2013. This was probably one of the reasons why Robert Myers’ garden disappointed me, by the time I got to it I’d had my fill of wafty, floaty planting. Another trend in recent years has been the use of greenery and minimalist planting. It was visible again this year although I’m not sure it was so intentional this time around with the weather playing its part. The concept of minimalist planting is an anathema to me. For me the dilemma is there are so many plants I want to grow and just not enough space. There is something a little strange about having a garden and then choosing to restrict the plants and colours in it. One of the reasons for such differing opinions between judges, designers and the public is that we tend to want different things. 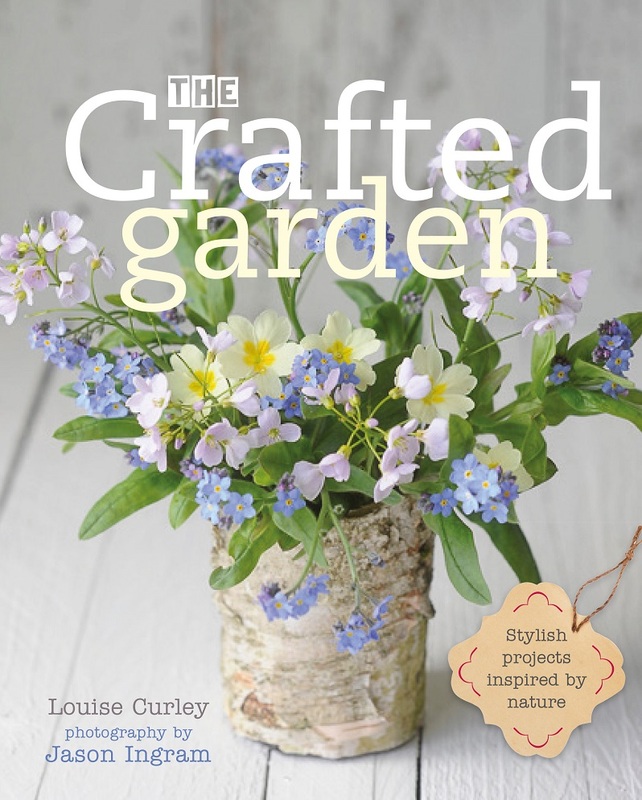 Judges are looking for adherence to the brief, designers the opportunity to express themselves and the public simply want something they like to look at, something they would want in their own garden. This is perhaps why Chris Beardshaw’s garden and his vibrant planting proved so popular with those I spoke to on Monday. In many ways, as visitors and viewers on TV, we need to suspend our disbelief and see the show gardens for what they are, a showcase. Big budget sponsors and top class designers are always going to want to create high-end gardens which most of us struggle to relate to but would we want to go to Chelsea and find something we could see in our own village or town? Probably not. Chelsea is about polished floors and walls made from copper, frame-less glass cubes and sunken seating areas. Every year there will be gardens that divide opinion and a garden that the public loves. But enough with the floaty planting, for one year at least. Writing my blog has shown me how much my mood is affected by the weather. It’s a fairly obvious observation that we feel happier when the sun shines and glum when it’s grey and wet but somehow seeing how I write over the course of the year, my choice of subject matter and how these reflect the weather outside has emphasised just how much it impacts on me. I had the pleasure of meeting the lovely Sejal again on Saturday night. A fellow attendee at Lia and Juliet’s supper club in Bristol she also reads my blog and it was interesting that my preoccupation with the weather and, in particular the amount of rain we get in Wales had been noted. Of course, my last post will have done nothing to change the perception that I am obsessed by the weather. So I thought I should try to redress the balance a little and write about the plus side to all the rain we’ve had in the last week or so. And I promise that’s the last time I mention the ‘r’ word, in THIS post at least. 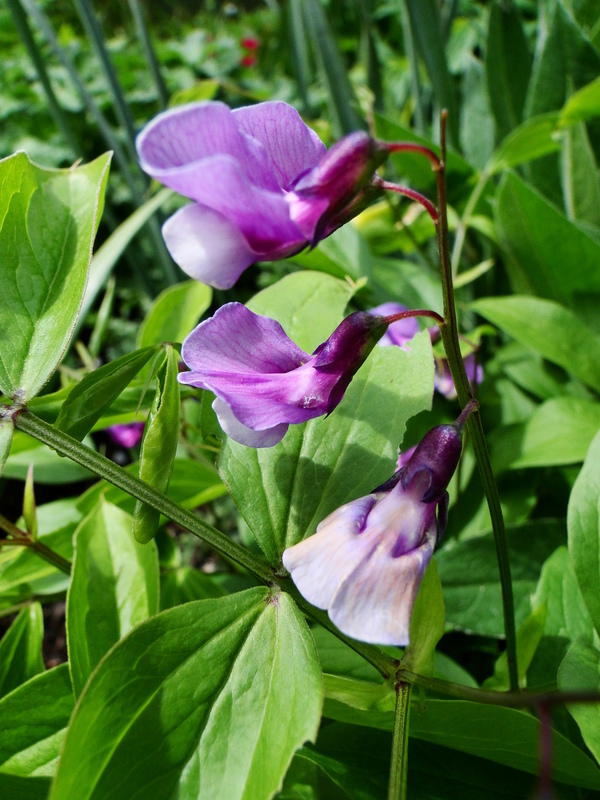 A wander around brings a few squeals of excitement as plants I had completely forgotten about have reappeared like my Lathyrus vernus for instance. I first saw this at Painswick Rococo Garden in Gloucestershire flowering in late March and thought it was a lovely little plant. Last year I tracked one down but when it didn’t seem to be poking through the soil I feared I might have lost it. But fear not, it must have just been biding its time through the cold spring and it has emerged with its delicate purply-pink flowers. There’s also been the discovery of a small patch of red campion by the side of my path. I’ll admit I do have a tendency to forget which plants I’ve bought and what I have put where. I do envy people who have an encyclopaedic knowledge of their plants, especially when their garden stretches to acres but it isn’t something I’m blessed with. I’m convinced, however that I have never purchased a campion plant so its appearance is an intriguing but welcome addition to the shady border. There’s reacquainting myself with favourite plants. 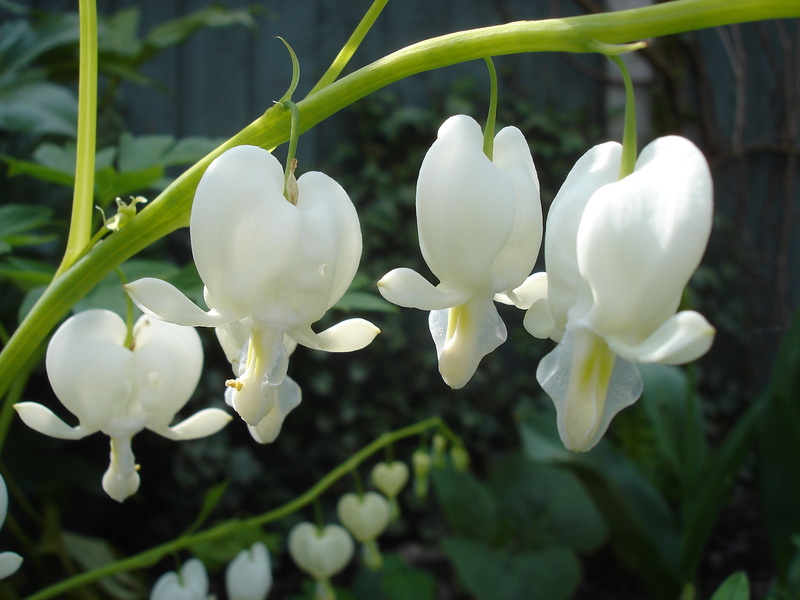 The pure white hearts of my white dicentra which would normally be going over by now dangle above the foliage of geraniums. The white and purple forms of viola cornuta which edge my paths and self-sown aquliegias that have popped up all over the place. I’m also eagerly anticipating the new plants added to my back border. I finally got around to removing some of the astrantia that had taken over but wanted to keep a soft, feeling, almost hedgerow-like and so have planted some foxgloves and wild carrot in there. They are still a while off flowering but should look good by mid-June. 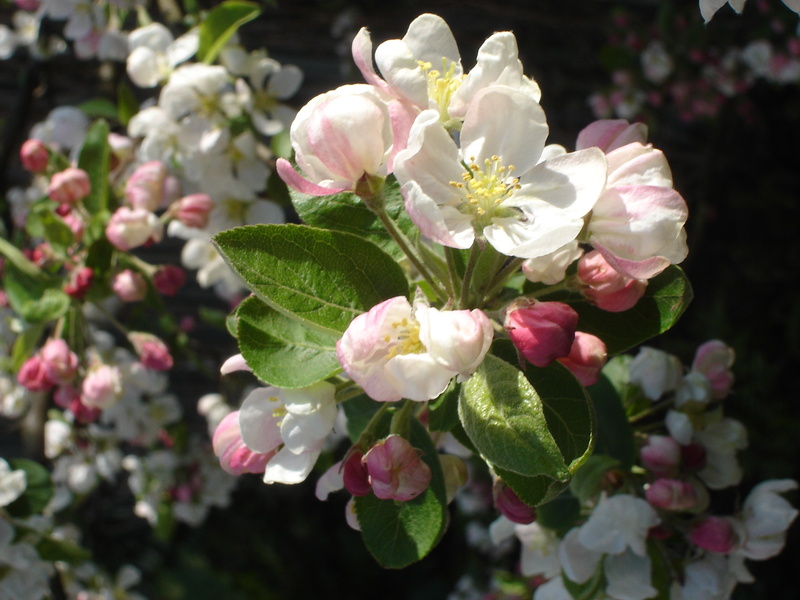 The espalier apple is looking good and has timed its blossom opening perfectly with the crab apple so that pollination should be ensured, just as long as the bees can brave the cold. There are fewer forget-me-nots than I would like. Even though they self seed I would normally sow some extras in June or July for the following spring but I forgot last year. So I’m making a note to remind me when I come to sow my biennials in a month or so. 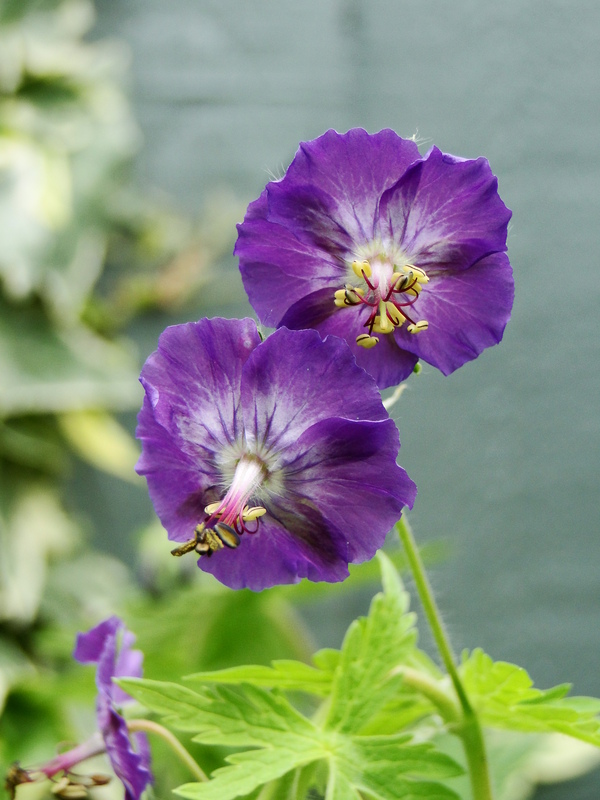 Geranium phaeum ‘Lily Lovell’ is just coming into flower. I love its rich purple colour which stands out so much more now that we have painted the fence. I love the contrast between the purple flowers and the bluey-green background. It doesn’t have a long flowering season but is out just long enough to grab any available light before the canopy of the crab apple casts its shade on this corner. It has been a bit on the chilly side recently to linger in the garden but if I shuffle the plants around in the greenhouse I can linger in there with a cup of tea and appreciate my spring garden at last. So it appears that pesky old jet stream is playing havoc with our weather again. Chilly nights, possible frosts and even the ‘s’ word has been mentioned for some parts of the country and yet it’s nearly the middle of May. I can empathise with the central character from the film Jean de Florette at the moment when he’s down on his knees looking up to the sky hoping that his prayers will be answered for the torrential, seemingly never-ending rain to stop. For me, and I’m sure all gardeners out there we’re hoping for some warmth to return. My crab apple finally came into blossom last week, a whole five weeks later than last year. My dicentra, a plant that is normally one of the first herbaceous perennials to flower in late March is only just sending out its pendant-like blooms. But, more importantly, I have a serious blockage. 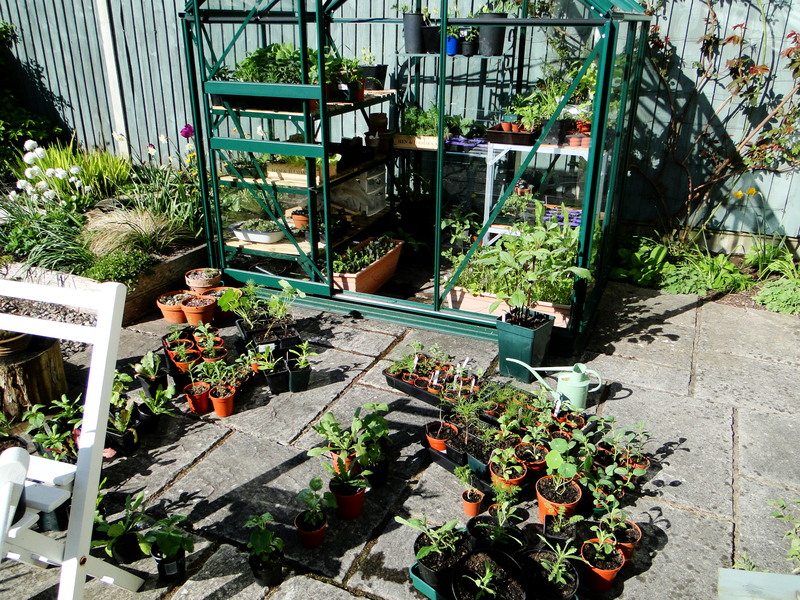 Windowsills are now groaning under the volume of pots, the greenhouse is so full I can’t even stand in it and there’s no more space left in the cold frames. Plants should, at this point, be moving through – some going into the ground at the plot, some being hardened off and second batches being sown of others. The plants are growing at a pace in the more clement conditions of my greenhouse and home but knowing they will either sulk or die if planted out I’ve had to embark on some serious potting on. I would normally only pot on into 9cm pots and then once those had been filled it would be time to plant out. This year I’ve got plants in 1 litre pots and some in 2 litre pots. The logistics of it all are proving somewhat trying. I’ve noticed recently on twitter the difference having a polytunnel seems to make. I read with envy the tweets about the crops that are already producing under cover and wonder whether climate change means that the only real way to grow in Britain in the future will be in polytunnels. I live in a part of the country where there has been quite considerable debate about the merits of covering vast swathes of land in plastic. There are parts of the Wye Valley and Herefordshire where field after field is under cover. Whether it’s to grow strawberries or asparagus, to produce early crops or simply to protect them from the weather, many argue they are a terrible blot on the landscape. The rolling hills and patchwork of fields are beautiful and it would be sad to see them swallowed up under polytunnels but the reality of what it must be like to earn your living from growing has really hit home since I took on my own allotment. For me it doesn’t matter if a crop fails. Don’t get me wrong it’s annoying, frustrating and disappointing but we won’t starve, I can simply pop along to the supermarket or farmers’ market and pick up something for dinner. But if your living depends on the crops you grow being a success then the British climate can be your downfall. And, how agriculture and horticulture deal with the weather should matter to us too if as consumers we want a ready supply of food. The idea that we could have another year like the last one makes me wonder how many businesses could cope and how many of us gardeners would lose the enthusiasm for growing our own. Polytunnels, particularly when used on a large-scale bring their problems. Where does all that rainwater go that runs off the plastic? Some argue it causes flooding. Then there’s the glare created from sunlight, if we ever get any, bouncing off the plastic covering. There’s the manufacture of all that plastic, although a lot of it is now recycled once finished with. On the other hand growers say they use fewer fungicides and they have almost eliminated problems caused by wet weather on soft fruit crops. I know how many strawberries I lost last year to mould caused by too much rain. Whether you believe in man-made climate change or not it is hard to deny that our weather is becoming more unpredictable. In the nineties we were told a warmer climate would be of benefit to growers in the UK. We’d be basking in Mediterranean temperatures growing olives and all manner of exotics. It’s a complicated business predicting the weather let alone our future climate and so it seems those initial suggestions are fading away. Instead, the seasons are becoming quite muddled and when it rains it doesn’t seem to know when to stop. Parts of Wales had a month’s worth of rain yesterday. Growing under cover certainly seems to be one way of coping with whatever the weather may bring. My small, unheated greenhouse even on a cold wet day feels quite warm, and protected from the wind and rain it’s no wonder my plants inside are growing quickly. The reality outside is somewhat different. Our growing season is short enough so at the moment I’m weighing up my options. Emigrating sounds appealing but for the time being unrealistic, putting up a walk-in polytunnel on my allotment is prohibited and getting a larger garden where I could erect said tunnel isn’t the cheapest of ideas. For the moment I think some cobbled together mini tunnels with the help of Wellyman this weekend is the only solution. Oh, and making an offering to the sun gods in the hope that Mother Nature will be kinder to us this year.